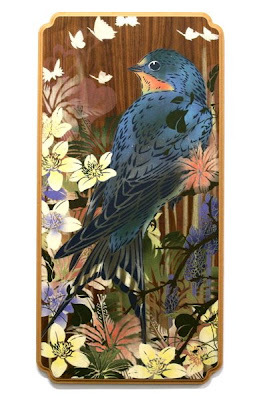 Found these beautiful stencilled birds by flox on the Aroha Lamour website, which I found via the sunday project (lots of exciting stuff happening there too - check out her archives for a brilliant postcard campaign - such a clever way to contact people). Also via Aroha Lamour, fabric designs by Leanne Culy. 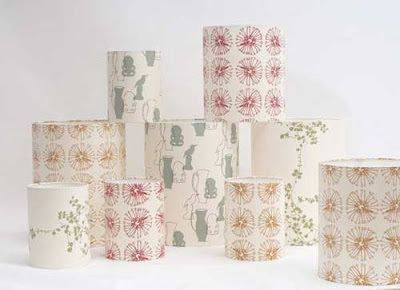 Not only lampshades, cushions too. I want to stencil! I want to make cushions! I want to make stencilled cushions! I had this week planned like an intricate military campaign, but I'm need of sleep... overslept by about 3 hours yesterday, and despite that have come down with a cold today. Bleh. I want to stencil too! Feel better soon. wow! to think what started as a little postcard project to keep my brain from whirring into overdrive has resulted in spreading the word of a great little shop right here in my corner of the world. i'm super chuffed and i'm sure Aroha Lamour is too. For anyone who's interested, Aroha is Maori for 'love'. Its great when you get all fired up and ready for some printing! Thats how I feel at the mo about my little houses. me aroha flox and aroha lamour!